Wi-Fi (802.11a/b/g/n), Straight Shooter, 2D Imager, Windows Embedded Compact 7, 48 key Keypad, 512MB RAM/2GB ROM, Bluetooth, High Capacity battery. Interface cables and charging cradle sold separately. Single slot charging cradle kit (Part# CRD-MC32-100US-01). Four slot charging cradle kit (Part# CRD3000-400CES). Wi-Fi (802.11a/b/g/n), Gun grip, 2D Imager Scanner, Windows Embedded Compact 7, 48-key Keypad, 1GB RAM/4GB ROM, Bluetooth, Color Touch Display, High Capacity battery. Interface cables and charging cradle sold separately. Single slot charging cradle kit (Part# CRD-MC32-100US-01). Four slot charging cradle kit (Part# CRD3000-400CES). Wi-Fi (802.11a/b/g/n), Gun grip, 2D Imager, Windows Embedded Compact 7, 48-key Keypad, 512MB RAM/2GB ROM, Bluetooth, High Capacity battery.Interface cables and charging cradle sold separately. Single slot charging cradle kit (Part# CRD-MC32-100US-01). Four slot charging cradle kit (Part# CRD3000-400CES). 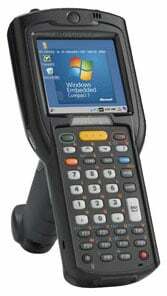 Gun grip, 2D Imager, Windows Embedded Compact 7, 38 key Keypad, Wi-Fi (802.11a/b/g/n), Bluetooth, High Capacity Battery. Wi-Fi (802.11a/b/g/n), Gun grip, 1D Laser, Windows Embedded Compact 7, 48 key Keypad, 512MB RAM/2GB ROM, Bluetooth, High Capacity battery.Interface cables and charging cradle sold separately. Single slot charging cradle kit (Part# CRD-MC32-100US-01). Four slot charging cradle kit (Part# CRD3000-400CES). Wi-Fi (802.11a/b/g/n), Straight Shooter, 1D Laser, Windows Embedded Compact 7, 48 key Keypad, 512MB RAM/2GB ROM, Bluetooth, High Capacity battery. Interface cables and charging cradle sold separately. Single slot charging cradle kit (Part# CRD-MC32-100US-01). Four slot charging cradle kit (Part# CRD3000-400CES). Wi-Fi (802.11a/b/g/n), Rotating Head, 1D Laser, Windows Embedded Compact 7, 48 key Keypad, 512MB RAM/2GB ROM, Bluetooth, Standard Capacity battery. Interface cables and charging cradle sold separately. Single slot charging cradle kit (Part# CRD-MC32-100US-01). Four slot charging cradle kit (Part# CRD3000-400CES). 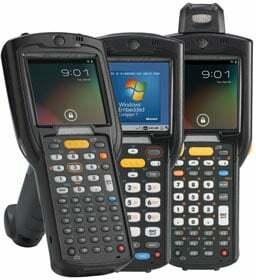 Gun grip, 2D Imager, Windows Embedded Compact 7, 28-key Keypad, Wifi (802.11 a/b/g/n), Bluetooth, High Capacity Battery. 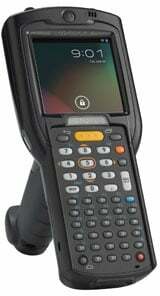 Straight shooter, 2D Imager, Windows Embedded Compact 7, 38-key Keypad, Wifi (802.11 a/b/g/n), Bluetooth, High Capacity Battery. Interface cables and charging cradle sold separately. Single slot charging cradle kit (Part# CRD-MC32-100US-01). Four slot charging cradle kit (Part# CRD3000-400CES). Wi-Fi (802.11a/b/g/n), Rotating Head, 1D Laser, Windows Embedded Compact 7, 38 key Keypad, 512MB RAM/2GB ROM, Bluetooth, Standard Capacity battery. Interface cables and charging cradle sold separately. Single slot charging cradle kit (Part# CRD-MC32-100US-01). Four slot charging cradle kit (Part# CRD3000-400CES). Wi-Fi (802.11a/b/g/n), Straight Shooter, 1D Laser, Windows Embedded Compact 7, 38 key Keypad, 512MB RAM/2GB ROM, Bluetooth, High Capacity battery. Interface cables and charging cradle sold separately. Single slot charging cradle kit (Part# CRD-MC32-100US-01). Four slot charging cradle kit (Part# CRD3000-400CES). Starter Kit Bundle: Includes Mobile Computer And Single-Slot Cradle Kit - Wi-Fi (80211a/b/g/n), Straight Shooter, 1D Laser, Windows Embedded Compact 7, 48 Key Keypad, 512MB RAM/2GB ROM, Bluetooth, High Capacity Battery . Interface Cables And Charging Cradle Sold Separately. Straight shooter, 1D Laser Scanner, Android Jelly Bean, 48-key Keypad, Wifi (802.11 a/b/g/n), Bluetooth, High Capacity Battery, Expanded Memory. Interface cables and charging cradle sold separately. Single slot charging cradle kit (Part# CRD-MC32-100US-01). Four slot charging cradle kit (Part# CRD3000-400CES).